Open daily Saturday through Thursday (closed Fridays). To celebrate the 100th anniversary of the Woodring home, now encompassed within J.N. “Ding” Darling National Wildlife Refuge boundaries, the “Ding” Darling Wildlife Society-Friends of the Refuge (DDWS) will partner with the Woodring family for a special two-month-long exhibition in the admission-free Visitor & Education Center Auditorium. The exhibition’s public unveiling will take place at 9 a.m. on Wednesday, January 23. At 10 a.m., nationally renowned Teddy Roosevelt reprisor Joe Wiegand will make a special guest appearance, and Ralph Woodring will recount stories about growing up in the home and on the island. Another presentation will take place at 3 p.m., with a free showing of the WGCU film Untold Stories: Sanibel I at 1 p.m. 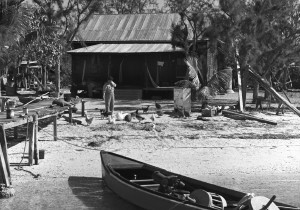 Through March 25, the exhibition will feature historic black-and-white images by the late Charlie McCullough, a professional photographer who lived next door to the home, and artifacts from the Woodring home and the Sanibel Historical Museum and Village that chronicle the landmark and the family’s life on Sanibel Island. Costumed museum docents will be on hand to interpret exhibits.